The NBA Draft Lottery is an annual event held by the National Basketball Association (NBA), in which the teams who had missed the playoffs the previous year participate in a lottery process to determine the draft order in the NBA draft. The NBA Draft lottery started in 1985. In the NBA draft, the teams obtain the rights to amateur U.S. college basketball players and other eligible players, including international players. The lottery winner would get the first selection in the draft. The term "lottery pick" denotes a draft pick whose position is determined through the lottery, while the non-playoff teams involved in the process are often called "lottery teams." Under the current rules, only the top four picks are decided by the lottery, and are chosen from the 14 teams that do not make the playoffs. The team with the worst record, or the team that holds the draft rights of the team with the worst record, has the best chance to obtain a higher draft pick. After the top four positions are selected (from the lottery slotting system), the remainder of the first-round draft order is in inverse order of the win-loss record for the remaining teams, or the teams who originally held the lottery rights if they were traded. The lottery does not determine the draft order in the subsequent rounds of the draft. Beginning with the 2019 draft, the NBA changed the lottery odds (the bottom three teams will all have an equal 14% chance of winning the top pick) and increase the number of teams selected in the lottery from three to four. In the earlier drafts, the teams would draft in reverse order of their win-loss record. However, a special territorial-pick rule allowed a team to draft a player from its local area. If a team decided to use its territorial pick, it forfeited its first-round pick in the draft. In 1966, the NBA revamped its draft system, and introduced a coin flip between the worst teams in each conference to determine who would obtain the first overall draft pick. The team who lost the coin flip would get the second pick, and the rest of the first-round picks were determined in reverse order of the win-loss record. The coin-flip system gave the worst teams in each conference an equal chance to have the first draft pick, but had a disadvantage in that the two worst teams overall could be in the same conference; in this situation, the second-worst team overall would have no chance of obtaining the first draft pick. After the 1984 coin flip, which was won by the Houston Rockets, the NBA introduced the lottery system to counter the accusations that the Rockets and several other teams were deliberately losing their regular season games in order to secure the worst record and consequently the chance to obtain the first pick. The lottery system involved a random drawing of an envelope from a hopper. Inside each of the envelopes was the name of a non-playoff team. The team whose envelope was drawn first would get the first pick. The process was then repeated until the rest of the lottery picks were determined. In this system, each non-playoff team had an equal chance to obtain the first pick. The rest of the first-round picks were determined in reverse order of the win-loss record. Starting from 1987, the NBA modified the lottery system so that only the first three picks were determined by the lottery. After the three envelopes were drawn, the remaining non-playoff teams would select in reverse order of their win-loss record. This meant that the team with the worst record could receive no worse than the fourth selection, and the second-worst team could pick no lower than fifth, and so on. The New York Knicks were the first winner of the lottery in 1985. They selected Georgetown University standout Patrick Ewing with their first overall pick. However, speculation arose that the NBA had rigged the lottery so that the Knicks would be assured to get the first pick. Even though the envelope system was highly criticized, it was used until 1989 before being replaced by the weighted lottery system in 1990. In 1990, the NBA changed the format of the lottery to give the team with the worst record the best chance of landing the first pick. The worst non-playoff team that season would have 11 chances, out of 66, to obtain the first pick. The second worst would have 10 chances, and so on. Similarly to the previous system, the weighted lottery system was also used only to determine the first three picks, while the rest of the teams selected in reverse order of their win-loss records. Despite the weighted odds, the Orlando Magic managed to win the lottery in 1993 with only one chance to obtain the first pick as it was the best non-playoff team in the previous season. In October 1993, the NBA modified the lottery system to give the team with the worst record a higher chance to win the draft lottery and to decrease the better teams' chances to win. The new system increased the chances of the worst team obtaining the first pick in the draft from 16.7 percent to 25 percent, while decreasing the chances of the best non-playoff team from 1.5 percent to 0.5 percent. In the new system, 14 numbered table tennis balls were used. Then, a four-number combination from the 14 balls were drawn to determine the lottery winner. Prior to the draft, the NBA assigns 1,000 possible combinations to the non-playoff teams (the 11–12–13–14 combination is ignored and redrawn). The process was then repeated to determine the second and third pick. The table below shows the lottery chances and the probabilities for each team to win the first pick in the weighted lottery system in 1993 and 1994 draft. In 2014, the NBA Board of Governors voted on a proposed reform to the lottery. If the proposed changes passed, the four worst teams in the league would have been given identical odds (around 11 percent) at winning the top pick. The fifth team would have a 10 percent chance and the odds would decrease for each team picking after. The proposed changes would take away the advantage of having the worst record in the league (currently the worst team is given a 25% chance at the pick), and would work to keep teams competitive throughout the entire season. The final vote was 17-13 in favor of the reform, but that was short of the required 23 votes needed to push the change through. In 2016, Dikembe Mutombo made people question the draft's legitimacy when he prematurely tweeted a congratulatory message to the Philadelphia 76ers for receiving the first pick hours before the lottery was conducted. Philadelphia did indeed win the first overall pick. Further questions were raised a bit when the NBA Draft revealed that every spot remained exactly the same as it was before the event took place, which was the first occurrence in draft lottery history. A year later, Lakers executive Magic Johnson raised even further questions about the draft process with him assuring head coach Luke Walton that the Lakers would acquire a top 3 pick for the 2017 NBA draft after an interview Walton had on May 4, 2017, twelve days before the draft lottery commenced and moved up to the second pick. As a result of the way teams like the Philadelphia 76ers were manipulating draft odds in their favor by losing games on purpose, starting September 28, 2017 with the end of the 2018 NBA draft, the NBA implemented a new system discouraging teams from going through Philadelphia's route in the mid-2010s by not only giving the worst three teams equal odds at the #1 pick, but also increasing their odds at going down within the draft with four teams being selected instead of the usual three. In 1995, the NBA had an agreement with the two expansion franchises, the Toronto Raptors and the Vancouver Grizzlies that neither team would be eligible to obtain the first overall pick in the 1996, 1997 and 1998 drafts. The Raptors won the 1996 lottery but were forced to settle for the second pick. Another combination was drawn and resulted in the Philadelphia 76ers getting the first pick. Two years later, the Grizzlies won the lottery and likewise had to pick second in the draft, while the L.A. Clippers obtained the first pick. The Raptors did not pick first until 2006, when they won the lottery as the fifth-worst non-playoff team. The Grizzlies have yet to hold the first selection. The lottery is normally held during either the third or fourth week of May. To determine the winner, fourteen ping pong balls numbered 1–14 are placed in a standard lottery machine and four balls are randomly selected from the lot. Just as in most traditional lotteries, the order in which the numbers are drawn is not important. That is, 1–2–3–4 is considered to be the same as 4–3–2–1. There are a total of 1,001 combinations (or (14x13x12x11) / (4x3x2x1)). Of these combinations, one outcome is disregarded and the remaining outcomes are distributed among the 14 non-playoff NBA teams. The combination 11–12–13–14 (in any order that those numbers are drawn) is not assigned and is ignored if drawn; this has never occurred in practice. In the event a lottery pick is traded to another team, the record of the original team (whose pick it was before the trade) still determines eligibility for the lottery, and assignment of chances. The following table listed the odds for each seed to get specific picks if there were no ties (rounded to three decimal places). The following table lists the odds for each seed to get specific picks, beginning with the 2019 draft, if there were no ties (rounded to three decimal places). In the event that teams finish with the same record, each tied team receives the average of the total number of combinations for the positions that they occupy. In 2007, the Minnesota Timberwolves and the Portland Trail Blazers tied for the sixth worst record. The average of the 6th and 7th positions in the lottery was taken, resulting in each team getting 53 combinations (the average of 63 and 43). Should the average number not be an integer, a coin flip is then used to determine which team or teams receive the extra combination. The result of the coin flip is also used to determine who receives the earlier pick in the event that neither of the tied teams wins one of the first four picks via the lottery. The lottery is conducted with witnesses (from the accounting firm Ernst & Young) verifying that all fourteen balls are represented once as they are placed in the lottery machine. The balls are placed in the machine for 20 seconds to randomize before the first ball is drawn. The remaining three balls are drawn at 10-second intervals. NBA officials determine which team holds the winning combination and that franchise is awarded the #1 overall draft pick. The four balls are returned to the machine and the process is repeated to determine the second and third picks. In the event that a combination belongs to a team that has already won its pick (or if the one unassigned combination comes up), the round is repeated until a unique winner is determined. Prior to the 2019 draft, when the first three teams had been determined, the remaining picks were given out based on regular season record with the worst teams getting the highest picks. This assured each team that it could drop no more than three spots from its projected draft position. Beginning with the 2019 draft, the number of combinations drawn is increased from 3 to 4, with the remaining picks still assigned based on regular season record. A team then drops no more than four spots from its projected position. In a case where a lottery team trades its pick to a playoff team, the playoff team assumes the lottery team's position in all draft lottery situations, unless provisioned by the conditions of the trade. The decision of not showing the ping-pong balls live has fueled speculation that the NBA occasionally fixes the draft lottery if it can benefit the league. The speculation originated with the 1985 draft lottery that sent Patrick Ewing to New York, with the theory being that the NBA wanted to send the best player in the draft to New York to increase ratings in a large television market. At that time, the NBA used seven envelopes in a tumbler representing the seven teams with the worst record. Some have speculated that the envelope containing the Knicks logo was refrigerated beforehand, enabling David Stern to recognize and select it. Another conspiracy theory suggests that one of the seven envelopes was thrown into the tumbler, causing one of the corners to fold. After the envelopes were mixed, Stern took a deep breath before reaching into the tumbler and picking the envelope with the folded corner. No one has ever explained why all the other teams would go along with the fix. Afterward, the Draft Lottery Format was changed to the current ping-pong ball lottery in a private room with team representatives. However, despite the lack of any evidence, conspiracy theories still persist regarding the annual outcome of the lottery. Visual representation of the following table. The largest upset in the lottery occurred in 1993 when the Magic won the lottery with just a 1.5% chance to win. The second largest upsets occurred in 2008 and 2014 when the Chicago Bulls and Cleveland Cavaliers both won their respective lotteries with just a 1.7% chance. In 1999, the Charlotte Hornets also overcame long odds in the draft lottery when they won the third pick despite having the best record among all non-playoff teams. The Hornets only had a 1.83% chance of winning a top-three pick. Since the lottery was introduced in 1985, only 18 of 30 NBA teams have won the lottery. The Los Angeles Clippers have won five lotteries, although two of them were conveyed to other teams in trades prior to the lottery. The Orlando Magic and Cleveland Cavaliers are second with three lottery wins each. Since the weighted lottery system was introduced in 1990, only seven teams with the worst record went on to win the lottery while only four teams with the second-worst record have won the lottery. ^ a b c d From 1985 to 1988, each of the 7 non-playoff teams had an equal chance to win the lottery, i.e. 14.29%. ^ The Philadelphia 76ers obtained Los Angeles Clippers' first-round pick in a previous trade on October 6, 1979 that sent Joe Bryant to the Clippers. On June 16, 1986, after the lottery and a day before the draft, the 76ers traded the first pick to the Cleveland Cavaliers in exchange for Roy Hinson. ^ In 1989, each of the 9 non-playoff teams had an equal chance to win the lottery, i.e. 11.11%. ^ a b c The Toronto Raptors and the Vancouver Grizzlies were not eligible to win the lottery in 1996, 1997 and 1998 due to their expansion agreement. Therefore, their lottery combinations for the first pick were excluded. 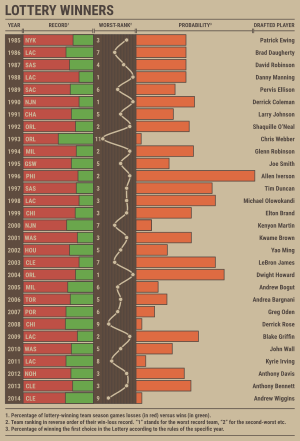 ^ Due to the 1998–99 NBA lockout, the season was shortened to 50 games per team. ^ The Los Angeles Clippers and the Washington Wizards had identical 19–63 records for 2nd-worst record in the NBA. However, the Wizards won the tiebreaker and were awarded one extra lottery combination. ^ The Cleveland Cavaliers had two lottery picks, their own pick and the Los Angeles Clippers' pick. The Cavaliers obtained the Clippers' first-round pick from a previous trade on February 24, 2011 that sent Mo Williams and Jamario Moon to the Clippers and Baron Davis to the Cavaliers. The Cavaliers, who had the second-worst record (19–63), had a combined total of 227 chances (22.7%) to win the lottery, which consists of 199 chances (19.9%) from their own pick and 28 chances (2.8%) from the Clippers' pick. ^ Due to the 2011 NBA lockout, the season was shortened to 66 games per team. "Evolution of the Draft and Lottery". NBA.com. Turner Sports Interactive, Inc. Retrieved August 22, 2009. "Year-by-Year Lottery Probabilities". NBA.com. Turner Sports Interactive, Inc. Retrieved August 22, 2009. ^ a b c Dengate, Jeff (May 16, 2007). "Let the Ping-Pong Balls Fall". NBA.com. Turner Sports Interactive, Inc. Retrieved August 22, 2009. ^ a b Bondy, Filip (May 22, 2005). "The Draft That Changed It All. Tanks to '84, the lottery was born". NYDailyNews.com. New York: Daily News, L.P. Archived from the original on July 7, 2011. Retrieved August 22, 2009. ^ a b DuPree, David (June 25, 2007). "25 drafts, dozens of stars, one Michael". USA Today. Retrieved August 22, 2009. ^ "League has used variety of methods to determine No. 1 pick". The Indianapolis Star. May 22, 2007. Retrieved October 4, 2009. ^ Blinebury, Fran (May 19, 2009). "Winning the Lottery is easy; picking the right player is not". NBA.com. Turner Sports Interactive, Inc. Archived from the original on May 23, 2009. Retrieved August 22, 2009. ^ Florke, Chad R.; Ecker, Mark D. (December 1, 2003). "NBA Draft Lottery Probabilities" (PDF). University of Northern Iowa. Retrieved August 22, 2009. ^ "Lottery Reform Vote Set to Pass?". basketballinsiders.com. ^ Higin, Sean. "Report: Board of Governors expected to pass draft lottery reform, Sixers and Thunder opposed". probasketballtalk.com. Retrieved October 21, 2014. ^ "Lottery reform falls short of passing". ESPN. October 22, 2014. Retrieved April 20, 2015. ^ Lawrence, Mitch (January 12, 2003). "'New' Charlotte Gets Fast Break". NYDailyNews.com. New York: Daily News, L.P. Archived from the original on August 28, 2011. Retrieved August 22, 2009. ^ "Clippers Get Pick Of The Litter". CBS News. CBS Interactive Inc. May 17, 1998. Retrieved August 22, 2009. ^ Dengate, Jeff (May 16, 2007). "Let the Ping-Pong Balls Fall". NBA.com. Archived from the original on June 13, 2012. ^ Schoenfield, David (June 29, 2009). "The first lottery draft still rates the best". ESPN. Archived from the original on June 27, 2009. ^ Helin, Kurt. "David Stern expects your draft conspiracy theories now". nbcsports.com. Archived from the original on June 13, 2012. ^ "David Stern, Jim Rome battle on radio". ESPN. June 13, 2012. Archived from the original on June 13, 2012. ^ Matuszewski, Erik (May 21, 2008). "Bulls Win NBA's Draft Lottery, Eye Beasley, Rose With Top Pick". Bloomberg. Bloomberg L.P. Retrieved August 22, 2009. ^ "All-Time Transactions". NBA.com/Clippers. Turner Sports Interactive, Inc. Archived from the original on February 21, 2010. Retrieved August 22, 2009. ^ "Roy Hinson Stats". basketball-reference.com. Retrieved April 8, 2012. ^ Beck, Howard (February 14, 2009). "N.B.A. and Union Are Discussing New Labor Deal". The New York Times. Retrieved February 22, 2009. ^ "Ties broken for Draft 2009 order of selection". NBA.com. Turner Sports Interactive, Inc. April 17, 2009. Archived from the original on April 20, 2009. Retrieved August 17, 2010. ^ "Baron Davis traded for Williams, Moon". ESPN. February 24, 2011. Retrieved April 8, 2012. ^ "Cavaliers win draft lottery, will pick No. 1". NBA.com. Turner Sports Interactive, Inc. May 17, 2011. Archived from the original on May 21, 2011. Retrieved May 18, 2011. ^ "Cavs win No. 1 pick; Wolves 2nd". ESPN. May 18, 2011. Retrieved May 18, 2011.